This is such a fun springy look. Even though the weather is still unpredictable, how can you not feel like spring is here when you are wearing such bright colors?! Unfortunately, we have had TERRIBLE weather the last couple days including...snow flurries! I can't wait for warmer weather. 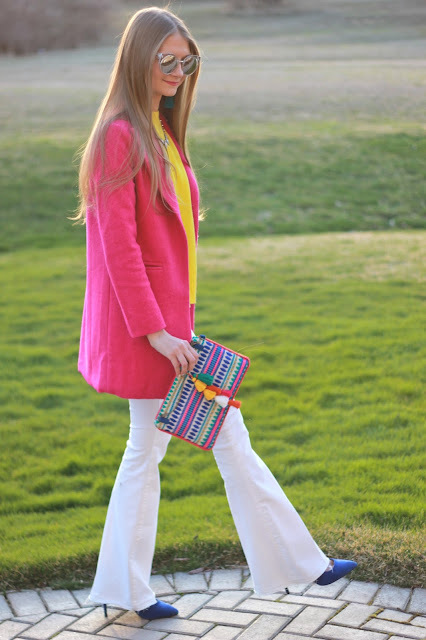 These bright colors are so fun to wear, no matter the weather. I'm a firm believer in dressing how you feel (and not necessarily practical for the weather). It's back to school for us this week. It was so nice to have a whole week off, but it went by WAY too fast (as usual). I had so many things on my to-do list to get done over break and did not seem to accomplish much! It was so nice to just take the time to relax and sleep in and not be so busy, but I need to get a move on with a few wedding things. Thank goodness it's already hump day! Thanks for stopping by! Fashion lover with a side of sweet treats. Subscribe to the Sweets and Style Just Right mailing list to receive new posts in your inbox!